Please let your staff know about these emails, let’s keep your network as safe as possible. HAPPY HOLIDAYS! Send this email to all your staff or have them all sign up to our News Letter to stay informed. Should you shutdown or restart your computer? The answer is YES. You should shutdown or restart your computer at least once a week. This will allow some of the internal hardware to take a break and cool off from an every day power consumption and heat, it will also help the system to apply Windows Updates and Antivirus Updates. While we are trying to keep your computers up to day, not everyone is in the Workstation Maintenance program and this is causing some antivirus not been able to get the latest update or perform the full deep scan. We will schedule a system restart on October 24 2016 at 7:00pm to allow the workstations to get the latest updates from our Antivirus system. Please let your staff aware of this restart so Monday they close any opened document, file, QuickBooks or anything on their system. The best thing to do is to tell the staff to Close and Log Off the system (Do Not Shutdown). Also remember to tell your staff to register on this News so they can also receive any Important or Critical notifications from us directly. As you know Florida is in the Hurricane Watch for Thursday and as much as we will like to continue working during the storm, as a Network Administrator I do not recommend that. The UPS Battery Backups for all Nova Momentum Computer customers are setup to start the shutdown process of the server 5 minutes after power to the building is cut off. This is to give some servers plenty of time to shutdown properly without causing data damage but sometimes, services and software override this shutdown command causing the servers to stay powered until the battery runs out. DO NOT rely on the batteries to keep the server on during the storm. Tonight Wednesday October 5th starting at 5:00pm I will manually launch a Full Server Backup. Anything done on Thursday will be backup on a regular schedule but in case of an emergency the server will be restored back to October 5th. Protect the computers close to windows by either relocating them or by covering the computers and monitors with garbage bags. After all the equipment is turned off proceed to the server room and turn off the servers. In the event that you don’t know how, let me know so I can connect remotely and do it for you. Wait until the servers are powered down completely and then turn off the UPS Batteries as well, this normally should shutdown any internet equipment as well. Remember to have your staff join this Newsletter for important news and articles. We wanted to let you know that a new Agent for our Remote Management has been release. The new version is 10.4.3, this new agent will be pushed to all the computers today 10/4/2016 at 10:00pm. If for any reason your computer is off during this new agent, it will be installed automatically the next time the computer is powered on. You don’t have to do anything on your end, this update will be done in the background and shouldn’t affect any other software installed. This is just a notification. 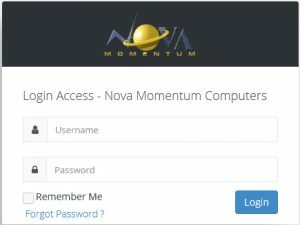 You are receiving this notification because Nova Momentum added your email to our email subscriber list. Is very important that you don’t unsubscribe since this will be main resource that we will use to communicate with our customers when it comes to Important or Critical issues that may affect your business. Since this will be hosted on our website for future reference you can always go back to our website and read the latest news. In the event that you are experiencing problems with emails you can always visit our site and look at the latest news to see if is related to your problem. We will also use this method to inform our customers about new viruses attacks, changes in the computer business, new services, change of services and more. It will be good that you also share this notification to your staff, have them sign up to our blog, everyone in the company will be aware of what is going on. Is free and we won’t be sending blast emails every day but only when is necessary. Our news status will be divided in three main topics NEWS (like this one) IMPORTANT and CRITICAL. Please let your staff know about the importance of these messages to protect your network from any radical changes.